(AZORES, PORTUGAL: February 7, 2017): In celebration of the New Year, Azores Getaways, the largest tour operator in the Portuguese archipelagic Azores Islands, invites travelers to explore and experience the Azores with a fresh fleet of curated packages. Explore four stunning islands in the center of the Azores aboard the spectacular DuFour 460 Yacht. Fit for friends, families, or couples, this package invites guests to unwind and enjoy luxury yachting throughout the enchanting Azores Islands of Terceira, São Jorge, Pico and Faial. Disconnect from everyday life, hop from island to island, and swim in the crystal clear waters of the Azores. Yachting through the Azores provides opportunities to admire the mesmerizing coastline of the islands, sip wine off the coast of Pico, and indulge in fresh fish and while enjoying the sunset surrounded by the majestic Atlantic. · Discover Criaçao Velha, a unique and well preserved wine growing area, and descend into Gruta da Torres, one of the world’s longest lava tubes. 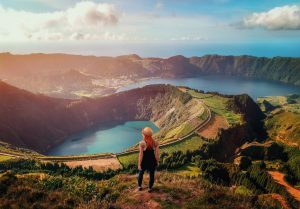 Island hop through São Miguel Island, Pico Island, and Terceira Island to marvel at the volcanic activity of São Miguel and its impressive crater lakes. 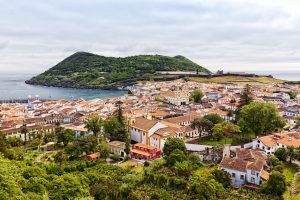 Explore Terceira Island and the oldest city in the Azores, Angra do Heroísmo, protected by UNESCO. Visit a 17th century fortress, dip into the natural swimming pools of Biscoitos or trek the protected natural park of Monte Brasil. Visit the UNESCO’s protected vineyards of Pico Island and climb the highest mountain in Portugal or simply admire its grandeur from different locations on the island. Visit the Whaling Museum and learn about the island’s rich history and past whale-hunting traditions. Fall in love with the beauty, charm and pristine nature of Pico Island, São Miguel Island, Terceira Island. Travel to the stunning island of São Miguel and experience diving in one of the best off-the-beaten path diving sites in Europe. São Miguel Island offers an abundance of diverse marine life and crystal clear water making this Azorean island the perfect dive location. Visitors can explore underwater steep walls, volcanic arches, caves, seamounts, shipwrecks, and swim along an oasis of sea species. Away from the waters, take time to enjoy the stunning natural beauty of São Miguel with its lush green vegetation, crater lakes, volcanic activity, and picturesque villages. Soak in a natural hot spring surrounding by exotic flora and marvel at the dormant volcanoes and the breathtaking landscapes of the island. São Miguel Island’s thrilling undersea world together with its breathtaking beauty and unique experiences make it a world-class diving and vacation destination. Travel to the beautiful islands of the Azores and experience world-class canyon and cave hiking in unspoiled green forests filled with exotic flora, gorgeous waterfalls, crystal clear water, and amazing views. The Azores, known as one of Europe’s best spelunking destinations features adventurous discovery and exploration of São Miguel and Terceira as visitors can descend canyons, jump into natural pools, rappel down waterfalls and slide between rocks in this magical surrounding. The beauty of São Miguel and Terceira islands coupled with excellent spelunking experiences in spectacular surroundings make for an unforgettable vacation. Embrace the diverse landscape of the Azores with this packaged experience taking travelers from East to West among the islands – to the Western most point in Europe, in fact. An exotic green jewel in the middle of the Atlantic, São Miguel is the largest island of the archipelago, offering several enchanting locales such as the only tea plantation in Europe, natural geothermal hot springs for bathing, volcanic crater hiking and spelunking, and the historical city of Ponta Delgada. Westward bound, this Azores Getaways package takes travelers next to Flores, named after the island’s great amount of flowers, particularly hydrangeas, a magical tranquil place of stunning natural monuments. Marvel at its deep valleys and high peaks and admire the array of crystal-clear waterfalls and streams around the island.